Another interesting book which tells the story of the seventeen tours of Australia made by England since the end of World War II. Huw Turbervill starts in his introduction by detailing the history of pre-World War II tours of Australia by England and then concentrates on every tour since. Having interviewed many of the participants from Sir Alec Bedser to Ian Bell, he is able to relate in detail not only what happened on the field but also the difficulties faced in this appropriately named book. Many may think that there are harder tours but Huw Turbervill mentions in detail the difficulties faced by the tourists: heat, partisan behaviour from the crowds and, in earlier tours, the length of the tour. Not forgetting, of course, that the earlier tourists had to travel by sea and that the tourists could be away for up to eight months. With the help of participating players, we learn of the first time that the tourists could fly – in Economy – to Australia, the unhappiness of some players not being able or allowed to bring their families whilst other senior players could and the general change in this stance over the years. Each chapter begins with a quote which encapsulates one of the main topics of each tour and, in the first chapter on the 1946-47 tour, some unusually strong words from Wally Hammond which show that Anglo-Saxon was alive and well, after a disputed decision against Don Bradman which made a great difference to the outcome of the First Test. 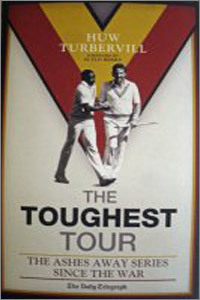 Many topics which people associate with these tours are mentioned: from the divide between the amateurs to professionals on the 1962-63 tour through the ugly scenes and eventual walk-off by the England players in 1970-71 due to crowd provocation, Lillee’s aluminium bat to the whitewash of the 2006-07 this book covers everything that anyone interested in England tours of Australia since the end of World War II could wish to know. A selective coverage of photographs relating to the iconic moments of each tour appears at the beginning of each chapter and the book is beautifully presented.